I enjoyed being a Jack of All Trades and there was no one else apart from a helpful Case Worker, formerly a Hospital Lady Almoner. But now all those roles I had to play have their own Professions – Clinical Psychologist, Social Worker, Educational Psychologist, Counsellor, Psychotherapist, Family Therapist, Play Therapist….All that remains is the medical bits – Neurologist and Physician, and nowadays Team Manager and Supervisor. I have retired from paid work but play a role as a Trustee for a Child Educational, Care, and Fostering Charity where my former multiple roles are relevant – but I don’t believe that a Neuroscientist would be qualified or fit for such a role…So I am now labelled as “Old School” – very happy with that! Turkey – is it fit to join the EU? 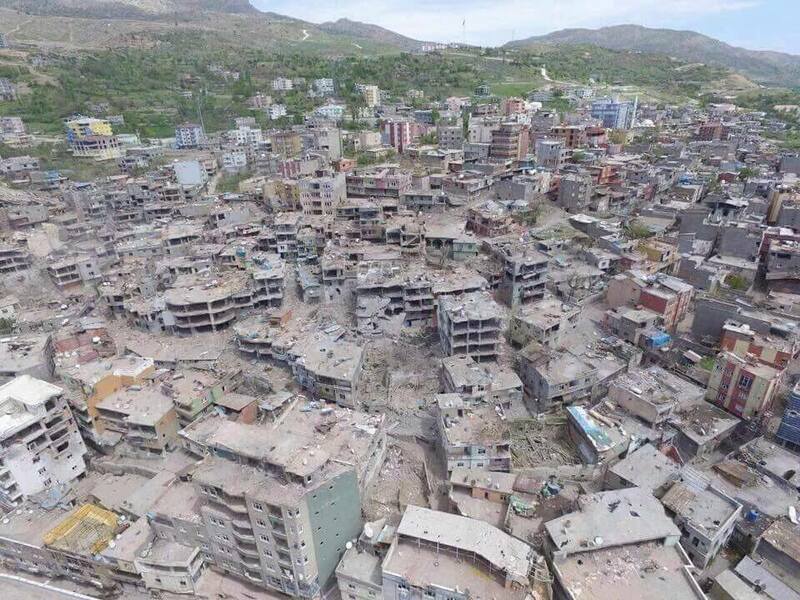 This is not Syria – it is Sirnak, a Kurdish town in South East Turkey – destroyed by Turkish shells – do we really want to encourage the Turks to join the EU? Do we want to be in the EU wirth Turkey who have a huge Army and are not exactly democratic – but Merkel is all over their President promising him access for Turks in exchange for an immigrant deal – what in Hell’s name will the EU look like if Turkey gets in with a huge population, economy — and Army? But no doubt Turkey will save the EU – on its terms. After a bit a walking about in Cirencester while Sarah Johns was in the Laboratory at the Uni, I came home to find that Martin had done a great job upgrading the gates and fences at Terstan. After Tea I used my final bit of energy to go and see the posts Martin had installed at the top of our two tracks near the road. Feeling virtuous I picked up some litter by the road, and then tipped over on my back, just as a very pretty lass was jogging by. She managed to get me vertical, and she told me she was a Hungarian living locally. Well I was flirting with Brexit, but I am now deffo leaning towards the EU – and hopefully more Hungarian lasses, because I am sure to fall over again if I see one! So Obama is coming to lecture us on not leaving the EU. I can think of nothing more counter productive for the remain campaign than this! People in the UK are likely to do the opposite of what he wants to spite the Yanks – it would be seen as hypocritical for him to tell us what do do bearing in mind how the US operates and how unlike that country many of us wish to be. If the EU signs TTIP then the US could fleece us all together in one flock, so it is in their interests for us to be in the EU – but not in our interest perhaps? Muslims in Britain are generally peace loving and patriotic. However many show a disrespect for women and for gay people to put it mildly. But intolerance is greatest within their own very separate communities, especially to those not from their own mainstream. The fervour against the more open Ahmadi community is particularly unacceptable. Let us hope that better education and more integration with people who share kinder and more open beliefs will lead to less intolerance, but I am not holding my breath…..
Taxes and a fairer distribution of wealth – he pays the piper calls the tune? Practising or the Grand National……? When I said that we were practising for the grand National this morning I did not expect Sarah to take me literally! However away we flew over the Downs and round part of the old Danebury Race Course up past Shepherds Bush to Spitfire Wood and beyond. Chocolate de la Suisse ridden by Miss Johns and Sonadora (Dancing Dora) with me on board gaiting together up hill and down dell at more than my normal speed! It was, at times, hard to hold Dora back, but luckily I managed it – and also stayed on. I did ask myself “Is this the right thing for a 71 year old, with a 50 year history of neuro disease, to be doing?” But it is amazing what an old man will do accompanied by a young lass…. I am not, and never have been, a Tory voter but I dislike personal attacks on Cameron just because, through no choice of his own, he had rich parents and went to a posh school. There are and always will be exceptions but most politicians are doing a difficult and complex job, whether Left, Centre or Right in inclination. Yes, we must keep a close eye on them but maybe focussing on policies rather than personalities would be more helpful. Remember that if you have not got a Personality Disorder you have not got a Personality…. I have just finished reading this immensely entertaining book and was very pleased to find the words “To be continued….” on the last page. I have spent the last few days in the company of an endearing group of people interacting with each other in a flawed but amusing way – each to a greater or lesser extent vulnerable and misguided yet strong and dynamic at the same time. It has been a roller coaster journey ending in chaos but with the seeds of creativity nevertheless remaining – I look forward to seeing these seeds to grow into Toby’s next book. Indifferent Cosmos – Asks me the one question – Why do you live? Where does God or the Supreme Master or the big Light come in? Maybe this is a psychological need that humans have – for a Parent figure who will love them whatever and who has power to intervene and counteract nature where it is seen to be cruel and hostile – and unfair. Some people need this more than others particularly if they feel powerless and vulnerable. Religions can exploit this need, but religions can bring people together to care for each other. My own view is that yes, we need the light of awareness and compassion to paint our picture on the Cosmic blank canvass, and that the Cosmos is a complex and mysterious creation. Can we humans with limited brains begin to comprehend its purpose, if there is one? Can a dog riding in a car understand how it works! A dog does not have a need to understand but we humans are aware of more, including our mortality. In the end I believe that there is more to the Cosmos than my little transient life and that somehow each of our lives is an opportunity for experiment and improvement in some way. That is the Question that the Cosmos and Life asks us – what part will you play in the wonder, madness, and cruelty of the process of continuing creation?